MarketingSherpa recently published the results of a survey that queried marketers on their expected budget allocations for various lead generation activities. Most of the focus among those who have picked up on this data has been on the increased budget for digital activities—in particular, social. The data does indeed tell an interesting story about the overwhelming trend in marketing to move away from traditional outbound demand generation tools towards inbound tools like social, SEO, and content marketing. From a practitioner’s perspective, however, I take something else away from the data: if I thought my audience might be receptive, I’d be overweighting to direct mail and paid search. Sometimes in marketing it’s worth following the trends—not because they are trends but because they have become trends on the basis of positive reinforcement. SEO falls squarely into this category. There are times, though, when a trend develops out of wishful thinking and the fear of being left behind. While social absolutely has its merits and is a valuable tool for certain strategic situations, as a lead generation tool, I’d say the jury is still out. And that brings me back to direct mail and paid search. Given the choice between marketing where all your competitors are and marketing where they are not, I’ll go with the road less traveled, zigging when others zag. We marketers spend much time, effort, and money trying to craft creative that gets our messages noticed. What if you put yourself in a position to be noticed simply be being the only piece of substantive mail on your target’s desk or the top sponsored link in a search? I’m not advocating ignoring the social channel at all, but sometimes zigging can deliver a big return. A survey of SaaS business executives recently published by Pacific Crest (results available free here) reveals some interesting information about the profiles of higher-growth companies. The complement to this graph is the one below, which shows that the Fast Growers (>45% growth) have lower customer acquisition costs. 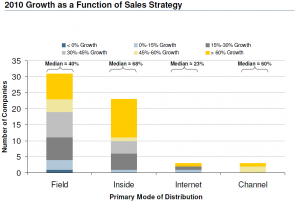 This differentiation is undoubtedly driven in part by the use of an inside sales force. The final piece of the puzzle is revealed in the following graph. This slice of the survey data shows that Slower Growers are much more focused on Enterprise customers. Fast Growers, on the hand, balance their Enterprise sales with a healthy dose of SMB sales. 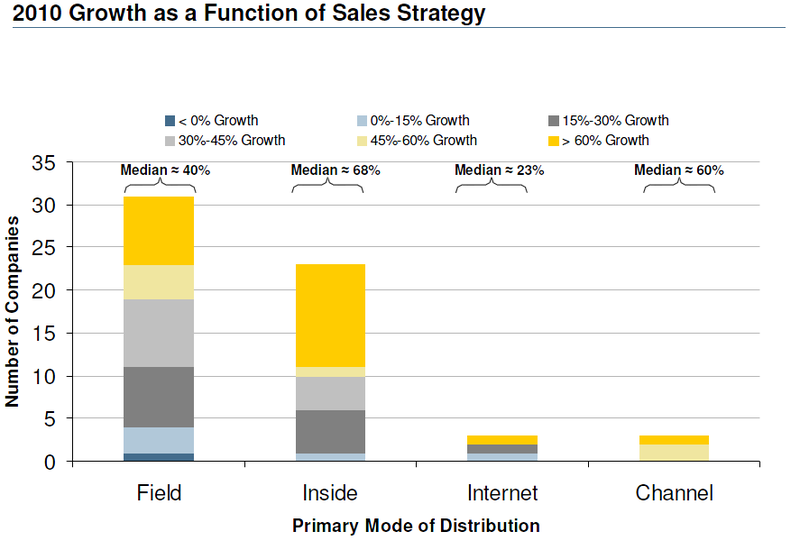 Of course, this data shouldn’t be read as an indictment of SaaS businesses that use field sales to sell mostly to the Enterprise; there are highly successful examples of such businesses. Instead, the data serves to highlight the achievement of those Fast Growers, and I hypothesize that effective marketing has played a key role in their success. It isn’t easy selling through an inside sales force to SMB; relationships are difficult to build over the phone and SMB management is often difficult to reach. Success, then, becomes a numbers game: Maximize leads (with a focus on inbound), and optimize conversions by creating tools to move prospects through the funnel. Without a highly capable marketing function, the numbers don’t add up and growth is elusive.